It's not enough just to market toys as gender neutral to avoid stereotyping. The toys themselves must cross the gender barrier. Experience shows that boys and girls tend to gravitate towards certain types of toys no matter what their upbringing, but by combining their modes of play we can bring both together. Take the dolls house, that picture of domesticity in miniature. Normally we might find little Maddyson's dolls happily baking cakes in the kitchen, but with the simple addition of Ninja traps and a samurai sword above the fireplace her brother Justeece's dolls will be putting down their beers next to the sofa in front of the television and be fighting off a bikie home invasion beside her in no time. Fowbia will be sure to join in Roofuss' toy soldiers game when she discover's Army HQ is equipped with a complete wardrobe of uniforms, including one for the post battle fairy princess ball. 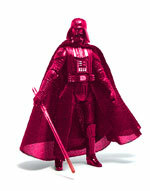 Pretty In Pink Darlene Vader, because the Dark Side of the Force is for everyone. 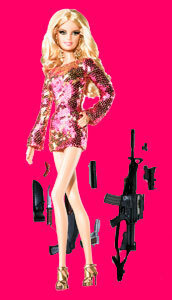 Assault rifle accessories for Barbie. It's important for boys to understand women are part of the military now. Simple changes such as these will help children break down gender stereotypes and help ensure that the next generation grows up in a post feminist gender equal society.